The city of New Orleans is where the past and present effortlessly comingle. Spending time in this intoxicating city can leave visitors heady with the “NOLA” (New Orleans, La.) experience. At any point in the day, the air is heavy with the fragrance of wisteria, Cajun food and often alcohol, and the sights — from street performers to Spanish- and French-influenced architecture to world-class art — are never ending. It’s easy to understand how many people find themselves New Orleans’ residents after only one visit to this fascinating city. Within minutes of the onset of Sunday night’s Welcome Social held in the French Quarter RV Resort’s courtyard, people were eating, drinking and being very merry. A few even donned Mardi Gras-colored jester hats. This unique RV resort cast its spell with its close proximity to the French Quarter, its stunning courtyard, and of course, the onslaught of 60 Marathon Coach Club members. With live music flowing poolside, passed appetizers and an outstanding barbecue spread kissed with Cajun spices, indulging the senses took no time at all. On Monday, April 18, attendees took to the streets of New Orleans — some by bus and others by Segway. 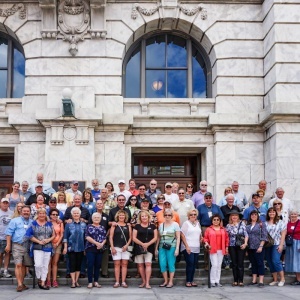 Those who chose the Southern Styles New Orleans City Bus Tour had a colorful guide with a vast knowledge of New Orleans’ history and culture. A visit to the 9th Ward brought pause to many attendees, as they heard details about Hurricane Katrina: stories of lives lost and what new measures the city has implemented to ensure the safety of current residents. Rally-goers met a gentleman who, after Katrina, bought houses adjacent to his home to create a memorial to those who died in the storm, as well as to honor legends who stemmed from the 9th Ward, including singer Fats Domino. 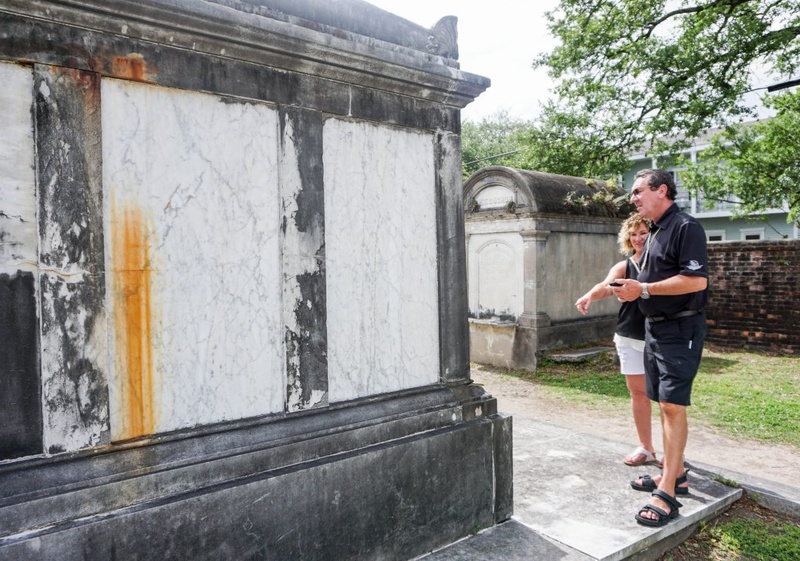 The group also visited Lafayette Cemetery No. 1, the Garden and Warehouse Districts, as well as other significant sections of the city. Those on the Segway tour participated in an hour and half ride through the French Quarter, stopping at historic locales such as Jackson Square and Louis Armstrong Park along the way. Cruising the French Quarter, the approximate 90-square-blocks of historic homes, shops, bars and parks between Canal Street and Esplanade Avenue, and North Rampart Street to the Mississippi River, proved to be a community with a rich back story. With its resident psychics, talented musicians, living statues and lush, green, subtropical park square, rally goers took some time to disembark their Segways to explore Jackson Square. Of course, few could resist the photo opportunity under the Louis Armstrong Park sign, especially with friendly tour guides willing to snap the perfect photograph. The oldest operating Catholic Church in the United States, St. Louis Cathedral, and the Old U.S. Mint were some of the other tour highlights. A free afternoon to further explore this friendly community was followed by a short bus ride Monday night to iconic Pat O’Brien’s on the River, famous for creating the rum-heavy Hurricane cocktail in the 1940’s. Prior to the evening’s festivities, the Club held its Spring General Business Meeting. Once the meeting was done, attendees were ushered into a private reception hall with sweeping views of the Mississippi River. Trays filled with Hurricanes were distributed and dueling piano players provided upbeat entertainment, causing spontaneous sing-alongs to erupt throughout the evening. The reception-style dinner featured passed appetizers, cheese and fruit platters, a carving station, an authentic New Orleans buffet and, of course, bananas foster for dessert. Tuesday morning greeted rally goers with sunshine and a uniquely NOLA buffet brunch at The Court of Two Sisters restaurant. A jazz trio provided wonderful ambiance as sunlight streamed through the wisteria-shaded courtyard. 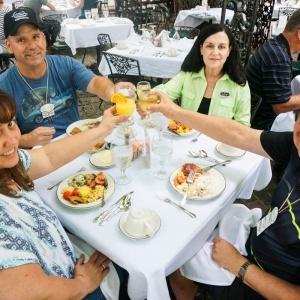 Attendees ventured from the courtyard into the 200-year-old building to fill their plates with hot and cold Louisiana delicacies such as shrimp étouffée, gumbo, jambalaya, boiled crawfish, turtle soup and a variety of delicious desserts. After brunch, a transportation bus escorted some of the attendees to an afternoon walkabout in the Garden District. Picturesque with its lush gardens and majestic houses, the Garden District walking tour provided examples of Greek Revival, Italianate and Gothic Revival architecture as well as some “shotgun” houses. The tour ended at Lafayette Cemetery No. 1, one of the city’s oldest cemeteries — it was established in 1833. Those who didn’t take the walking tour opted for the private cooking class at the New Orleans School of Cooking, located in a renovated molasses warehouse in the French Quarter. Here Chef Harriet taught the group how to make four regional dishes: corn and crab bisque, chicken and smoked sausage jambalaya, pralines and bananas foster. After sampling the wares and sipping on iced tea, lemonade and local Abita beer, it was time to shop for regional spices, cookbooks, candies and more in the cooking school’s general store. Tuesday’s free evening found many of the rally goers visiting local haunts known for exceptional food such as Commander’s Palace and Brennan’s. On Wednesday, attendees took a walk on the wild side when they ventured to the Honey Island Swamp, located about 30 miles outside of New Orleans in Slidell. 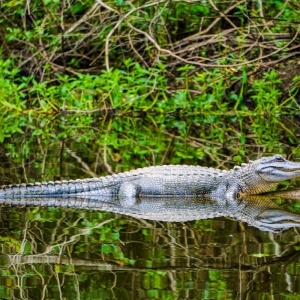 Knowledgeable Cajun Encounters’ tour boat captains escorted small groups to the interior of the swamp, pointing out wildlife — alligators, turtles, snakes and wild boar — while simultaneously sharing Louisiana history, including the devastation caused by Hurricane Katrina. From providing exceptional photo opportunities while feeding alligators marshmallows and hot dogs to pulling up crawfish traps, the tour was brimming with interesting sights. Haunting cypress trees with their knobby roots and exotic birds added to the mystique of the Honey Island Swamp. Wednesday night, attendees hopped aboard another boat — the last authentic steamboat on the Mississippi River — for a jazz dinner cruise on the Steamboat Natchez. This charming three-deck vessel provided picturesque views of New Orleans as the city’s lights reflected in the mighty Mississippi; incredible jazz music from the “Dukes of Dixieland” band floated through the air while attendees toasted and talked throughout the evening. The casual buffet-style dining experience proved to be a rally hit, providing a myriad of local delicacies. Thursday morning found a sizeable group gathered around Gary and Alice Nelson’s coach as Marathon Technical Support Manager Leon Snider led the “Tech Talk” session, which included a helpful Q&A exchange. to stand and cheer. Soon after, the six-piece Victory Six returned and the dance floor was filled until it was time to bid farewell. The following morning — after many hugs and fond farewells — it was time to depart until the Club’s next great adventure. Special thanks to Rally Hosts Lou and Pam Watson, Prevost and Marathon for putting together an unforgettable experience.